ONE OF the great pleasures of the early morning walk, jog, or run through the streets of Galway is that you can experience our urban landscape unencumbered with either human or motorised traffic. Rather than busy streets bustling with cars, buses, and other assorted vehicles, an open urban landscape opens up, presenting a vista that is quietly dignified and elegant. This is particularly evident as one turns into Eglinton Street and - perhaps more surprisingly - into Merchants Road. For those who are neither early risers nor athletically active, the recent publication by Currach Press of Paul Duffy’s second book of Galway postcards Galway City - Snapshots Through Time offers them an ideal chance to flavour the urban landscape as it was prior to the 1960s when there were so few cars on the road that Shop Street and High Street could still handle two way traffic. 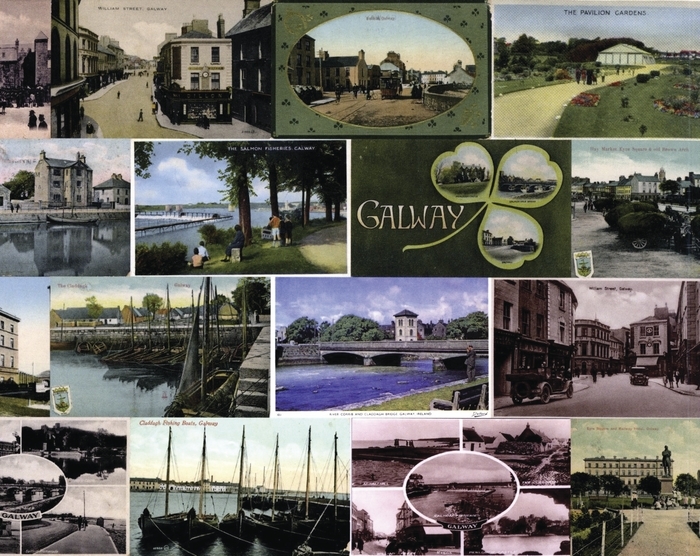 While there have been extensive changes in Galway’s urban landscape since the 1960s, there is a great deal that has not changed and as the presence of cars and other vehicles is at a minimum in these postcards, the book allows the reader to enjoy the elegance and the dignity of Galway’s streets. The tour begins in Eyre Square. Here the changes the city has gone through are most evident as the reader sees images of the Square from when the Dunkellin statute took pride of place in 1905 to 1965 after it had been revamped and renamed (at least officially ) as John F Kennedy Park. There are some striking cards depicting the Railway Hotel (now The Meyrick ), one of which shows the gable end of The American Bar, so called because emigrants had a last drink there before taking the long train journey to Cobh or Dublin to board the emigrant ship. Another feature of this section is cards of the many different fairs that took place at the top of the Square. Moving down the town through Williamsgate Street, William Street, and Shop Street the social and commercial history of Galway during the first half of the 20th century is documented as we move from trams to horse drawn hackneys to the more general use of cars, and there are many names over shop doors that were quintessentially Galwegian at the time but these shops are now long gone and largely forgotten. The book then visits St Nicholas’, the Saturday market in Lombard Street, the Spanish Arch, and the Fish market, before moving across the river to the Claddagh and out to Salthill. It is here the changes are most evident, particularly in the Claddagh as the original cottages long fallen into decay were demolished and replaced with more modern and sanitised housing. In Salthill, the atmosphere changes dramatically. Here we have sea, blue skies, sand, a diving tower, and dance halls. Again, despite all the cosmetic changes that have taken place, the village is still recognisable with the exception of the postcard depicting The Bal. But then that was even before O’Connor’s which was one of the earliest singing pubs in Ireland had taken over from Flynn’s bar. From there we move up Threadneedle Road, down Taylor’s Hill, up St Mary’s Road turning tight down towards the Cathedral and into Eglinton St with emphasis on the industrial, educational, and religious life of Galway. Paul Duffy’s Galway City - Snapshots Through Time is approximately a five mile walk, jog, run through Galway now all the more enjoyable despite the muscle grinding climb up Threadneedle Road.